Of particular interest are the feasts and festivals of the island. The great feasts of Christianity honored with pomp and revive traditions of the past. 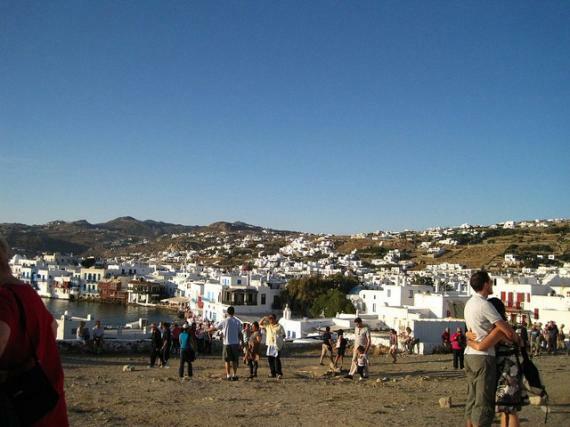 Also events that held in Mykonos, vary each year. Very popular are those organized at the Municipal Art Gallery, which occasionally hosts various exhibitions, as well as those organized by the Public Enterprise of Cultural Projection and Growth of Mykonos who coordinates the 'cultural summer. 'Do not forget the annual gay festival taking place in different places each time. Most festivals are accompanied by tasty food and dancing. And always you can find nearby flea markets, where you can buy lovely souvenirs. * In some areas, at Christmas Eve, children say carols holding lit lanterns or musical instruments. * At the carnival, stands out the disguised 'koukougeroi' while traditional custom is 'Klidonas' -a boy brings from the well the 'silent water' and puts it in a pot where everyone threw an object, the 'rizikari'. Τhe next day put his hand in the vessel and before pulling a 'rizikari', each girl is telling a poem. * At Mayday the locals make wreaths which burned on June 24, the feast of St. John the Fotaristi, where they lit a big fire and jump over it three times for good luck. * Visit the feast of St. Panteleimon (July 27) in Marathi, as the operation is performed in the medieval monastery of the area. * Feast of the Exaltation of the Holy Cross, celebrated in the chapel of the Cross at the airport and at the Mykonos Folklore Museum on September 14. * The Feast of the Harvest celebrated at the second Sunday in September at the Agricultural Museum. Villagers gather with their families, bring with them food and wine, bake bread in the oven, dancing and musicians playing bagpipes and ntoumpaki. * Chirosfagia (the celebration of the pig) celebrated throughout Mykonos in various small and big festivals in villages, especially in rural areas.Also the Folklore Association of Women of Mykonos each October celebrating chirosfagia in a mall or restaurant, with traditional songs and snacks. * Balosia, is the opening celebration of the naval period. On the day of the Lights (January 6), after the Blessing of the Waters, the Association of Women revives the custom of Balos in the center of Mykonos Town, with songs and food. * On the day of the Assumption, on August 15, Ano Mera festival takes place in front of the Monastery of Virgin Tourliani.